When it comes to dairy products in our everyday food intake, most people would say that they have milk or other dairy products daily, if not more! Milk, cheese, cottage cheese, yogurts, pudding and ice cream are some of the favorite dairy products of young and old alike. Dairy products are naturally abundant in protein, B vitamins, calcium, phosphorus and potassium. All of these nutrients are important for our body’s many functions. Healthy kidneys help remove waste products and extra fluid from the blood and help balance the levels of salt and minerals in the body. As kidney function declines, protein waste products, fluid, salt and minerals can rise to unsafe levels in the body and this may mean that dairy products must be limited. 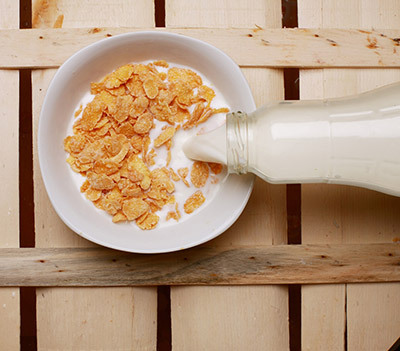 A closer look at these key nutrients in dairy foods will help those with decreased kidney function understand the importance of limiting dairy foods. Dairy products are a great source of protein. Protein helps build muscle and maintain our internal organs. Protein also helps to heal wounds and fight infections. We need protein sources in our diet daily, so if you need to limit protein due to decreased kidney function, it is important to balance the right amount of protein from animal and plant sources. Examples include dried beans, lentils, nuts, lean red meats, poultry, eggs, and dairy. Protein sources may have a higher potassium and phosphorus content. Your healthcare professional and dietitian will watch your blood levels of these minerals. Dairy foods are a common source of calcium in our diet. We need calcium for keeping bones and teeth strong and helping muscles contract, some blood clotting functions, and several nerve functions. When you need to limit intake of dairy products due to decreased kidney function, your calcium intake may be lower. Often you will still be able to have adequate calcium intake with a well-balanced daily diet of protein, whole grains, some fruits/vegetables, and a small amount of dairy. If you need a calcium supplement, your healthcare professional or dietitian will tell you the right type and amount to take. Phosphorus is a mineral found in many foods and is essential for the formation of bones and teeth. It plays an important role in how the body uses carbohydrates and fats for energy. It helps the body use protein for the growth, maintenance, and repair of cells and tissues. Healthy kidneys help remove extra phosphorus that the body does not use each day. With reduced kidney function you may need to limit intake of foods high in phosphorus to control how much phosphorus gets into your bloodstream. High phosphorus levels in your blood can cause your bones to lose calcium, making bones weak and brittle. The calcium lost from bone can also build-up in blood vessels resulting in “hardened” vessels. Dairy foods are higher in phosphorus, therefore your healthcare professional or dietitian may recommend limiting dairy to one serving a day. Medicines called phosphate binders actually help “bind up” phosphorus from foods while they are still in the stomach and help remove phosphorus from the body through the stool. Potassium is abundant in most dairy products as well as in many other foods such as certain fruits and vegetables, nuts, chocolate and certain salt substitutes. Potassium helps regulate the heart beat and help muscles contract. Potassium levels in the blood can build up when kidney function decreases, and then can cause heart and muscle problems. So, limiting your intake of dairy products may be necessary to control potassium levels in your body. Newer medicines that bind potassium are available, but your healthcare professional will decide if they are right for you. B vitamins are a group of eight vitamins that help the body produce energy from the foods we eat, and help cells and tissues stay healthy. Some of the B vitamins such as B12, thiamine, and riboflavin are abundant in milk products. An 8-ounce glass of milk has the full daily requirement for B12 for most age groups. Therefore, when it is necessary to limit milk and other dairy products from the diet, there may be a concern for some B vitamin deficiencies, especially with vitamin B12. Your healthcare professional may tell you to take a vitamin B complex supplement to help replace the B-vitamins that could be lacking due to a limited dairy intake. It is easy to see that although dairy products are rich in many nutrients, these same nutrients may need to be limited when kidney function declines. A nephrology or CKD dietitian is a great resource to help you plan a balanced kidney friendly diet.